Club Penguin Cheats by Mimo777 Club Penguin Cheats by Mimo777: New Club Penguin Postcards! Really! 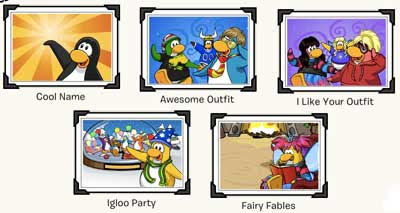 Cool Name, Awesome Outfit, I like your outfit, Igloo Party and Fair Fables! Preeeeety sure that's all of them. Is "Redecorated Igloo" new too? Reaching UNLIMiTED Fragger Gernades is so awesome! Redecorated my Igloo is new as well =D 9China9 sent me a few postcards! Mimo I commented on the postcards as soon as they came out and you didn't leave credit -- I even mentioned the redecorated igloo one! PLEASE leave credit next time! Cool Postcards! Redecorated igloo has been there for ages! No, its not actually. Redorted iggys have been around for like ages! LOL! Redecorated igloo. Hmmmmm, why does that name sound familiar? Oh, I remember correctly, it's an oldie. Mimo, I am not mad at you for calling it girly. Yeah, you should know I'm a girl but you are awesome, even calling it girly. The thing is, it's funny, not girly. Mimo probably found it out before you. Mimo only gives credit to the people who find it out before he knows. But great job! Maybe next time! Also the postcards are awesome! The re-decorated one is NOT new. And the postcards look awesome! Actually it is not. Some people are forgetting things. For example, people are saying that book is new. It's not. Last time earlier in 2009 when they renewed Fairie Fables, then they added the book. Also, I have seen that postcard like a couple months ago. Sorry! Don't be like that... Mimo gives credit where credit is needed. If you saw it first, he would have given you credit, I mean, it's Mimo, he's wicked nice..... Also, do not put (CPG MOD) after your name when you just make a statement, only if you answer a question, see the Mod Rules for more details. Hi cookie, I like the post cards too, but do not put (CPG MOD) after your name when you just make a statement, only if you answer a question, see the Mod Rules for more details. Well it takes time to make a post so maybe Mimo saw it before you and was just making the post. Mimo soz that I put (CPG Mod) next to my name before -- I thought u were allowed to if you said a cheat. But then I checked the rules again. So sorry! mimo they have a fairy fables one! i bet that one is your favorite one of them all! lol im going to send it to everyone i see! ive been waiting sooo long for them to make a cool name postcard! LOL! No. The only time you do that is when you answer a question like yours. No. You can only do that when you answer someone's questions like yours.